Tailor-made Masterbatches formulated according to a template or to a standardized color chart that are adapted exactly to our customers’ polymer. We provide Masterbatches based on PE, PP, PA, ABS, PS, EVA, etc..
Tailor-made pigment mixtures for profile extrusion, injection molding applications, and compound manufacturing. Here, it’s possible to dye almost all commercial polymers. All-purpose Masterbatches with a very high standard of quality. Almost all shades are heat resistant between 280°C and 300°C and have a high level of lightfastness (7-8). Immediately available ex stock from 1kg. 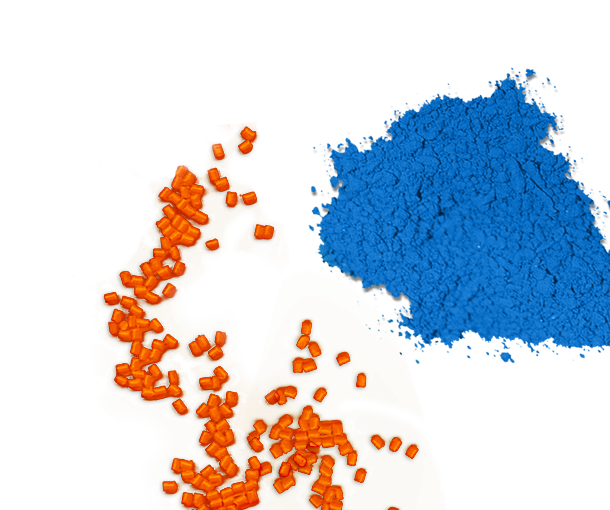 Tailor-made pigment preparations for dyeing in rotation systems and in the dry blending process. Excellent color results with the addition of only approx. 0.2% – 0.3% pigment to the powdered base polymer. For use with biopolymers, both Masterbatches and pure pigment preparations can be provided. The carrier material used should be selected according to whether it is “biodegradable” or “bio-based”. Tailor-made dyeing solutions for dyeing semi-finished products manufactured in a pressing and sintering process. High concentration of colors with a very good dispersion are adjusted according to the project. For use with wood plastic composites, we provide tailor-made Masterbatches and pigment preparations, which are adapted to the base material of the WPC and are provided with UV protection as needed. Our color concentrates for use with synthetic resins are available in all RAL colors. Special colors can be prepared upon request. Typical areas of application are Epoxy and MMA systems. Through the combination of pigments and additives, the required technical properties of the polymers are systematically changed. Possible additives are, e.g. antistatics, optical brighteners, UV stabilizers, laser additives. Our high-quality artist’s pigments have been developed specially for artist’s and restorers and can be incorporated into different binding agents, such as oil, water, acrylics, gouache. These Masterbatches are used for special color effects, such as translucent, transparent, pearlescent, metallic, glitter and interferences as well as for further new and unique color effects. Black and white Masterbatches based on PE, PP, PA, ABS, PS ,and EVA for different applications. Immediately available ex stock from 1kg.